The second page of each lesson consists of exercises designed to practice the material learned in the lesson. 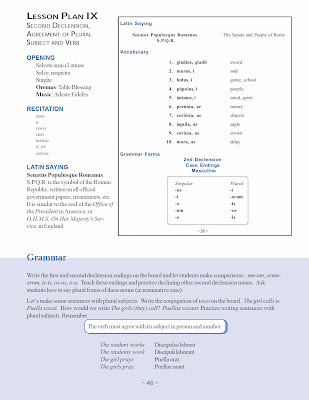 On this sample page, you can see that additional material from previous lessons is included to aid in the student’s retention of Latin vocabulary and grammar concepts. There are also entire review lessons periodically in the text. One of my favorite things about Latina Christiana is its simplicity. The workbook pages are uncluttered. The expectations are very clear, and the exercises are easy to complete using only the information in the workbook and teacher’s manual. The instruction is in the teacher’s manual only. 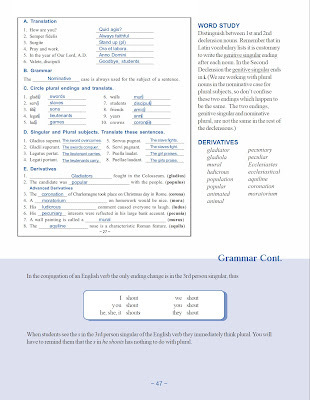 The student workbook contains information to study, but it does not contain any of the grammar explanations or the discussion of derivatives. Therefore, this course can not be completed without the teacher’s manual. Like the student workbook, the teacher’s manual is very well designed. 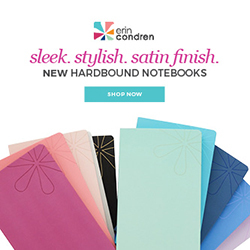 It is a metal spiral-bound book that contains a variety of helpful sections. It begins with an overview of Latin grammar. This is followed by the student goals for Latina Christiana 1 and guidelines for teaching Latin. There is a short history guide that covers Chapters 1-13 of Famous Men of Rome. (Additional Resource). 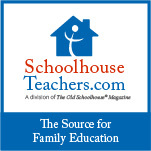 Following this introductory information are the lesson plans. Each lesson is only 2 pages. The lesson contains the complete student text with answers where applicable, as well as a very well scripted lesson plan. Following the lesson plans are reproducible tests and quizzes for each lesson and corresponding answer keys. Finally, there are words to the prayers, words and music to the songs, Latin charts of the noun and verb forms covered in the course, and vocabulary and derivative indexes. The text set includes a pronunciation cd. This cd includes all the prayers and songs. 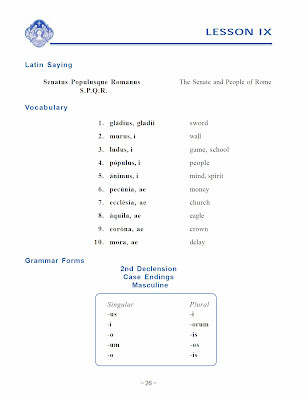 Also, for each lesson, an instructor recites the Latin saying, vocabulary, and grammar forms. This is followed by a responsive section for the child to repeat along with children on the cd. While I believe that the Teacher Manual, Student Workbook, and pronunciation CD provide ample instruction to teach and learn Latin, many people enjoy having their very own Latin instructor. The instructional DVDs include Leigh Lowe leading your students through the lessons as they are laid out in the teacher’s manual. The videos provide support for teachers who either feel unqualified, or lack the time to thoroughly teach the material to their students. The videos are of good quality and, like the program itself, are very simple and clear. They enable the student to work more independently, but I would recommend the parent studying along with the student even if they are using the DVD’s in order to provide assistance to their child. We have been studying Latin for several years in our homeschool. My daughter had just started Latin this year using a different curriculum. We both were so impressed with Latina Christiana that I decided that she will continue her Latin studies using Latina Christiana instead of the other program we were using. I also received the Famous Men of Rome, along with the Student and Teacher Guides. I mentioned this book as an additional resource to Latina Christiana I, but Latina Christiana I covers only 13 chapters. With the additional study guide, this book can serve as a complete one year course in Classical Studies. This reprinting of the classic Famous Men of Rome includes beautiful full-color illustrations. True to the simple style of Memoria Press, the student and teacher guides are clear, uncluttered, and easy to follow. The 30 stories in Famous Men of Rome are divided into 25 lessons with 5 additional review lessons. 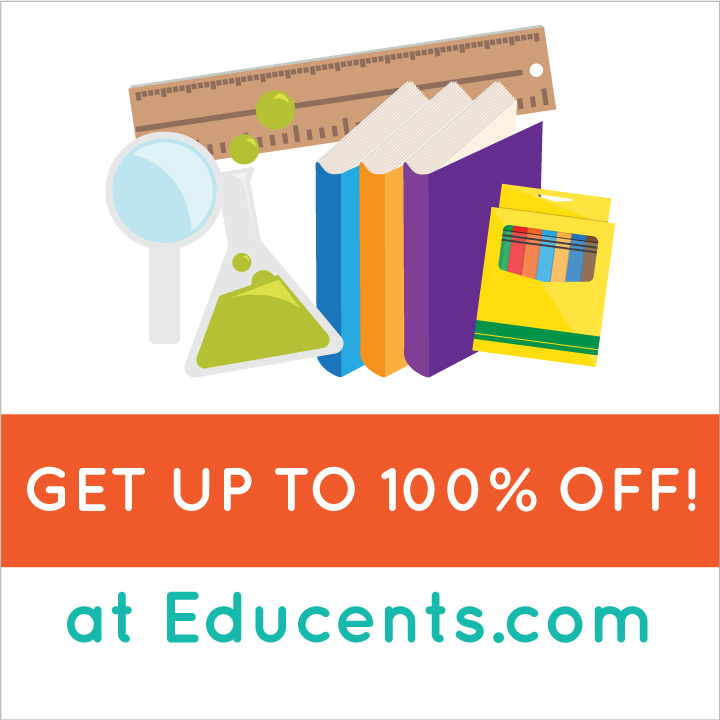 Each lesson consists of facts to know, vocabulary, comprehension questions, and activities. Included in the activity sections are timeline and map lessons, as well as various other activity ideas for each lesson.The teacher’s guide includes the entire student text with the corresponding answers. 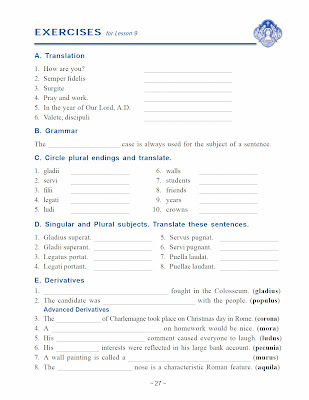 Also included in the teacher’s guide are Roman History tests, Roman History Drill Questions, a European geography test, and a very handy pronunciation guide. Most history curricula for this level provide either a very quick overview of Roman history or none at all. If you’re looking for a very thorough and rich study of Roman history at a more relaxed pace, I highly recommend this course. For my children, who are not especially fond of workbooks, I found it easy to utilize much of the content orally. But, if we had been going at their recommended pace, instead of racing through it like we were, the amount of writing would not have been overwhelming. The Latina Christiana I Text Set (including Teacher Guide, Student Book, and Pronunciation CD) is available from Memoria Press for $39.95. 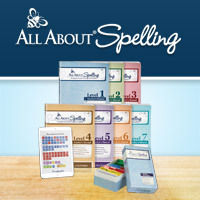 The complete set (including the text set PLUS the DVD’s and flashcards) is $97.90. Famous Men of Rome is available from Memoria Press for $16.95 and the complete set with Teacher and Student Guides is $39.95. Could this be used along with TOG? Or is that over doing the history? And at what level did you start Latin? I noticed there was Prima Latina which starts in kindergarten and Christina Latina which starts later on. The book Famous Men of Rome is actually scheduled for Upper Grammar History in Year 1 Unit 4. The Memoria Press guides could be used along with TOG for the comprehension questions, but you couldn't thoroughly use the guide at the pace that TOG goes through FMOR. Third grade is the recommended starting age for both Latin for Children and Latina Christiana, which are the programs I am most familiar with. They both offer an introductory program for younger beginners, but I've not used either of those. I did technically start Latin with my oldest in 2nd grade, but he was also doing 3rd grade English.